Whenever Palm Sunday comes around, we have an opportunity to accompany Jesus through the last days of his life, from his entrance into Jerusalem until he is laid in the tomb after his crucifixion. On entry into Jerusalem he rode a donkey, and was accompanied by waving palm leaves and cheers of praise! It was there that he prophesied about his betrayal by Judas and Peter’s denial of allegiance to him. It was there that he instituted the Holy Eucharist during the Passover meal. Jesus invited his disciples to join him in prayer at Gethsemane, but he later found them sleeping. In that same garden, Jesus was arrested and the authorities took him away, tried him before the Sanhedrin, and took him before Pilate who handed him over to the Romans for crucifixion. What has always stood out for me, besides the crucifixion, is the different responses of Peter and Judas when they were faced with the reality of their actions — a rejected Jesus. Peter was filled with lament. Scripture tells us he “wept bitterly,” a great expression of regret and opportunity for reconciliation. Judas, on the other hand, was fully aware of his intentions but then could not live with the outcome. As a result, he took his own life. The message for us is an invitation of reconciliation and healing through which we can obtain joy rather than a life of despair and gloom. — How do I feel when I know the right thing to do, but do the opposite? — Did I experience healing when I forgave someone who had wronged me? — What is the most significant part about the life of Jesus to me (and why)? As we accompany Jesus into Jerusalem during these last few days of Lent, let us not stop there, but continue all the way to the tomb and wait in hope for the promised resurrection! Kevin is a third-year theology student at Boston College. 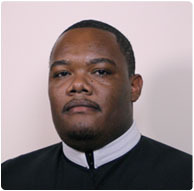 A native of the island nation of Dominica, he professed vows as a Redemptorist in 2007, and is expected to be ordained a deacon in October 2011.